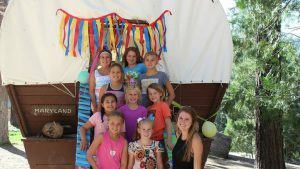 Wagon Train is an elementary-age summer camp for children that are part of the TCC Kids Mid-Week Program. It is a fun, rustic summer camp near Hume Lake with an Old West experience that includes sleeping in a real covered wagon, learning Archery and BB guns, riding canoes and kayaks around the pond, and exploring Fort Logan (their three-story island fort). But the fun doesn’t stop there! Camp-wide recreation games like Capture the Flag, the Water Carnival and our awesome night game, Stampede, will have your kiddos talking about camp for years to come. The campers will also sit around a campfire singing worship songs, memorize scripture, watch amazing skits about the Bible performed by the Wagon Train staff and hear each morning and evening about the good news of Jesus and His love for us. Your child will NOT want to miss this! Please click the link below to register your child and note the $100 deposit that is due at the time of registration. Upon receipt of the completed registration and the deposit, your child’s name will be added to the list. If your child is a TCC Mid-Week attender, please email kids@tccalive.org for a discount code to apply to your camper’s final registration payment that will be due by June 1, 2019. Any questions can be directed to Lori Van Hulzen at 559-799-6410.